Why is the kettle wall is formed with the time scale? What are some effective ways to get rid of it at home? What are the means at hand to help remove limescale? As you know, a clean kettle is a significant issueFor each hostess, and from the appearance of scale is not insured even the most expensive kitchen equipment. Therefore, sooner or later each landlady is faced with the question of how to clean the kettle from scum quickly and what means for this is most effective. In our today's article, we will try to reveal several such secrets. Where does the scum come from? Before cleaning the kettle, let's find out what scum is and where it comes from. Scale is a calcareous layering that forms on the walls of a cookware with constant contact with water and consists of particles of salts and metals of various types. The deceit of scum is that it has a lowThermal conductivity and therefore it takes much longer to heat water in such a container, and the heating elements of electric kettles coated with a limestone layer break down much faster if they are not cleaned in time. We'll use vinegar. 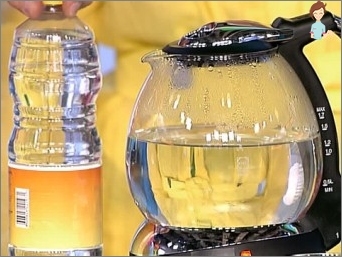 To clean the electric or enameled kettle from scale with vinegar, it is necessary to collect into it two three waters, and fill the remainder to the top with vinegar with 9% concentration. The resulting solution should be properly boiled, and then left for a few hours in a teapot. Then the water must be drained, and the device should be thoroughly rinsed off the scales and acetic acid residues. If, after the first procedure, the calcareous plaque does not go away, then the above manipulation should be repeated once more, and the scum will precisely leave the walls of your kitchen friend. 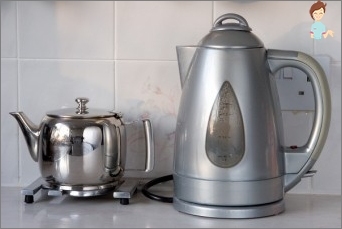 Do not leave boiled water in the appliance for a long time. It is better to boil a small amount of liquid, and excess to drain. We hope that our advice on how to remove scum in the kettle will help you solve the problem with your "Kitchen assistants"Without too much effort and quickly get an effective result. 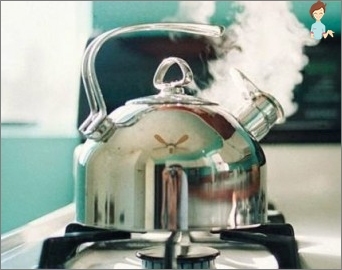 Let your kettle shine and delight you and your guests with delicious and aromatic drinks!